The town of Harlech lies in the heart of the Snowdonia National Park, overlooking Tremadog Bag and the Lleyn Peninsula. The town is one of Merionydd’s best kept secrets, and is dominated by the stupendous Rhinog mountain range, and its medieval castle. 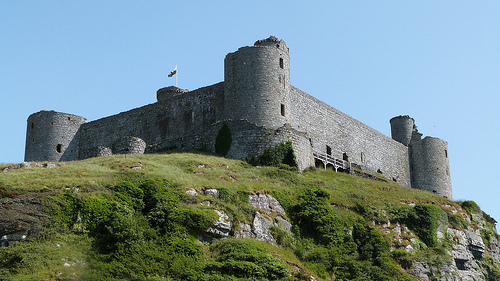 The steep, winding streets, magnificent natural setting and traditional Welsh architecture make Harlech an exciting and memorable holiday destination, and it’s the perfect base for exploring Snowdonia, the centre of Welsh culture and language. The traditional Welsh architecture in Harlech is one of the main reasons why visitors are attracted to the town. In Welsh mythology, Harlech is associated with the legend of Branwen, the daughter of Llyr, whose story is found in The Mabinogian, the masterpiece of Medieval Welsh literature. The tale places Llyr and Bronwe ‘upon the rock of Harlech overlooking the sea’. On this rugged promontory, the Harlech Dome is the oldest known geological rock formation in the world and is home to the architecture grandeur of Harlech Castle. Thanks to its stunning setting framed by the mountains of Snowdonia, it’s easy to see why this is one of the best loved castles in the British Isles. The castle was originally built in the 13th century by Edward I as part of his ‘iron ring’ of fortresses when North Wales was first captured, and today is a World Heritage listed site which is open to the public throughout the year and hosts a range of cultural events. The town of Harlech and the areas surrounding it have long been a source of inspiration for writers and artists. Robert Graves was a frequent visitor to the town, and his poems contain recordings of childhood memories spent in Harlech before WWI. For those interested in arts, Harlech’s Theatre Ardudwy hosts an impressive programme of exhibitions, films, plays and concerts throughout the year by both local and international companies and artists. If you visit Harlech in the autumn, you will be able to visit the bi-annual Art Festive, which exhibits work from artists originating from around the world whilst retaining a strong Welsh cultural presence. Harlech is a huge hit with nature lovers, as it’s an ideal base to explore and enjoy the rolling countryside which surrounds the town. The golden sweep of Harlech Beach attracts hundreds of families every year, as it’s the perfect setting for a family holiday or day out. North of the town, the Nature Conservancy Reserve of Morfa Harlech overlooks the Dwyryd Estuary to the Italianate village of Portmeirion. To the south, visitors can enjoy Llandanwg Beach, with its Celtic Church nestled in the dunes. Artro Estuary is the home of Llanbedr and Pensarn Yacht Club which is popular with tourists during the summer. South of the estuary, visitors can find Mochras, locally known as Shell Island thanks to the variety of crustacean life washed up on its shores. Last but not least, the impressive Rhinog mountain range, and the two main valleys are not to be missed, providing a multitude of walks and stiff climbs suitable for all abilities.